We all have to eat! Why not make a few connections and gain a little insight over breakfast? Learn more about career advancement and understand what it takes to run one of Greater Haverhill’s top organizations, or in this case departments? Don’t miss the Greater Haverhill Chamber during the September edition of the “Coffee with the CEO” breakfast program. This special monthly offering serves as a vehicle for top professionals like yourself to become acquainted with local business leaders, hear about their journey to top-level management, inquire about paths to success and better understand the roadblocks typical in today’s business marketplace. 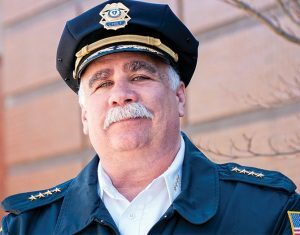 For the September program we will introduce Chief Alan DeNaro from the Haverhill Police Department to our members and their guests. Special emphasis on the unique opportunities and requirements of police officers, the challenges in managing a municipal department and the obstacles to career advancement in this industry. This interactive and informational offering is open to all business professionals wishing to attend and will provide an intimate mentoring-like agenda for young professionals, entrepreneurs and small business owners who may face challenges in launching or building their careers. Additionally, it is an excellent setting for seasoned professionals to assemble and brainstorm possible resolutions for business challenges and personal roadblocks currently hindering the achievement of their business goals, or reaching the next level in their careers, or realizing their true potential in business, community or professional roles. The Coffee with the CEO series will take place from 8 – 9 AM and is open to GHCC members and their guests. Continental breakfast will be provided. The September program will take place on September 13, 2016 at Haverhill Police Department, 40 Bailey Boulevard, Haverhill, MA. Registration is required. Cost is $5 Members and $10 Non-Members. Seats will be filled on a first-come, first-served basis. Alan R. DeNaro is a thirty-nine year law enforcement officer who has served the past fourteen years as the Chief of Police and Emergency Management Director for the City of Haverhill Massachusetts. In 2011 Chief DeNaro was appointed to the position of Commissioner of Public Safety. Haverhill currently has 200 sworn officers in the police and fire departments. Haverhill encompasses a geographical area of 34 square miles with a diverse population of 65,000 citizens. Prior to this position he served for approximately four years as the Chief of Police in Central Falls, Rhode Island. His professional career started in Oakland Park, Florida where he served with distinction for twenty-one years. While in Oakland Park he served as a Division Commander responsible for Professional Standards, Traffic, Criminal Investigations, Community Relations and Vice/Narcotics. Alan holds a Bachelor’s Degree from Barry University and a Master’s Degree in Criminal Justice from Anna Maria College in Paxton, Massachusetts. He is a graduate of the Harvard University Program for Senior Executives in State and Local Government and also the Florida Department of Law Enforcement Senior Leadership Program.